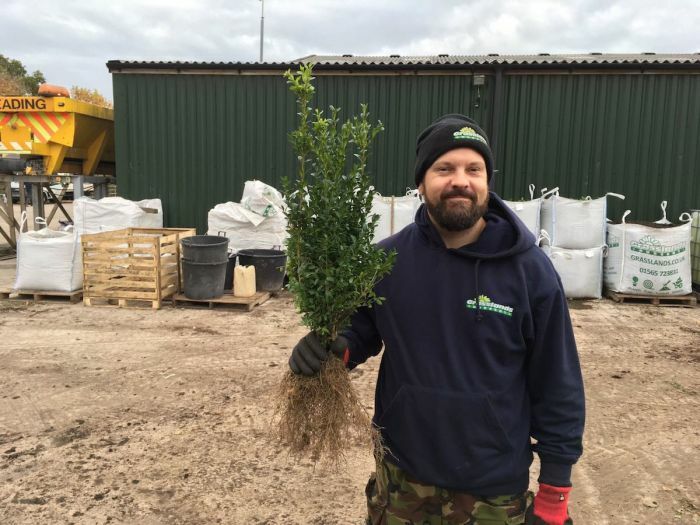 Buying bare root hedging is a really cost effective way to get a hedge for very small outlay per plant. It's not a guarantee of success and can sometimes lead to miserable failure. Ready your garden before you plant. Get rid of the grass and weeds within half a metre either side of the site where the new hedge is to be planted. Nothing kills more new hedges than letting trash compete for moisture in the spring. I've seen so many pictures of dead plant peeping out of a weed patch. As soon as the bare roots arrive get them planted straight away. If you can't plant them straight away then place them in a spot in the garden with all the roots covered with moist soil or compost. When you plant them cut them back by at least a third. Eg. if you bought plants 90/100 reduce the top growth to 60/70cm with sharp secateurs. This matches the top growth with the reduced root mass. You can get away with less top pruning with box bushes - they are so easy to establish with so much fine roots. Everything else should get the trim. Firm them in tight and watch out for them getting dry when they start to swell in the spring. Evergreen bare root like yew must be watered even in winter when you notice them getting dry at the soil level or the wind is drying them in the leaf. Do not plant any hedging in waterlogged soil. If you want a go at growing laurels from bare root, leave until the worst of winter has gone - end of Feb. They hate being too wet when most of their roots have been removed, better to do them just before they are ready to grow away in spring. It always pays to order about 10% spare as you will lose some plants, no matter how green fingered you are! Good luck..if you have questions, ask them before you get in a mess.